A new and unissued German Army webbing belt for the LKS system is the standard issue load carrying belt for the German armed forces. Made from tough and stable nylon webbing, the belt is a single layer with rivetted eylets set at regular intervals to accept the standard issue German webbing pouches in Flecktarn. These include the G3 magazine pouches, G36 single and double magazine pouches, MP5 magazine pouches, general purpose, water bottle and spade pouches, and accessory pouches such as the FFD pouch, phone or radio accessory pouch, tool pouch and other similar pouches offered in Flecktarn and desert Flecktarn. The belt is 10cm wide and comes with four, stitched-on mounting points for the shoulder harness. 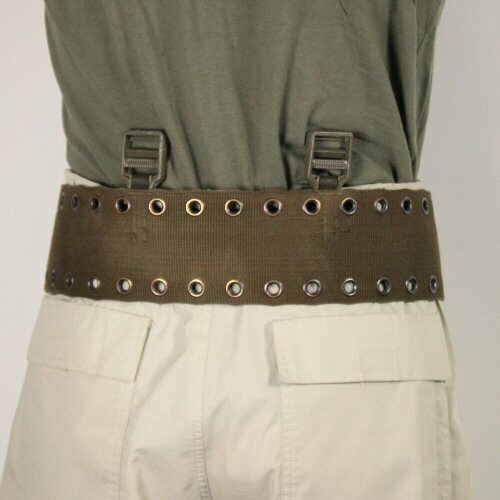 The belt is fastened together at the front with wide 50mm adjustable quick release buckle. 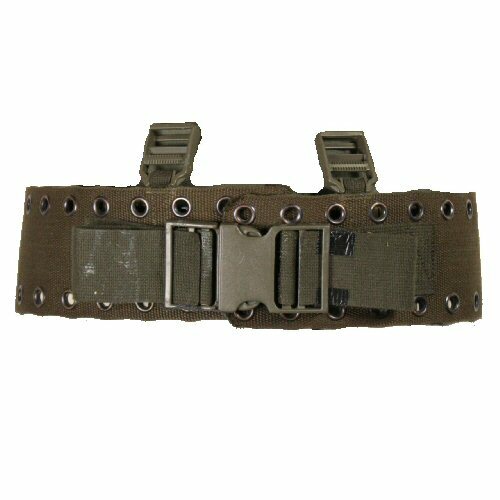 The buckle is fitted onto straps which are sewn onto the surface of the web belt, and offer a 20cm adjustment length from narrowest to widest fitting. Current size available is 90cm belt with 20cm of strap adjustment, or Medium. Rear of belt showing the shoulder strap attachments on the rear.